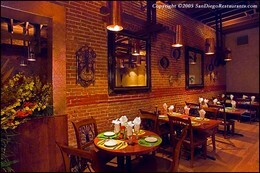 About: The Cancun Shrimp Ceviche is one of La Fiesta's unique appetizers that takes the flavors of Mexico and mixes it with the aromatic seafood of San Diego. Chef Aaron Valenzuela adds extra spices and cilantro to give this recipe a much needed kick with mango slices for an extra sweet effect. Place the tomatoes in a heat proof bowl and pour over enough boiling water to cover. Let stand for 1-2 min then remove the tomatoes with a slotted spoon. Peel off the tomato skins and refresh in cold water. Dice the flesh and place in a large, nonmetallic bowl. Slice the mango lengthwise on either side of the flat central seed. Peel the two mango pieces and cut the flesh into chunks. Slice and peel any remaining flesh around the seed then cut into chunks. Add to the tomatoes with any juice. Add the chili, lime juice, chopped tomatoes and salt and pepper to taste. Cover and let chili in the refrigerator for 2 hours to allow the flavor to develop. Remove the dish from the refrigerator and enjoy.